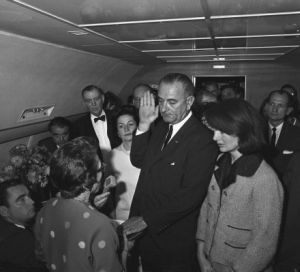 On November 27, 1963 just five days after the assassination of President John F. Kennedy in Dallas, newly installed President Lyndon Baines Johnson addresses Congress for the first time. His address appears below. The dream of conquering the vastness of space–the dream of partnership across the Atlantic–and across the Pacific as well–the dream of a Peace Corps in less developed nations–the dream of education for all of our children–the dream of jobs for all who seek them and need them–the dream of care for our elderly–the dream of an all-out attack on mental illness–and above all, the dream of equal rights for all Americans, whatever their race or color–these and other American dreams have been vitalized by his drive and by his dedication. Under John Kennedy’s leadership, this Nation has demonstrated that it has the courage to seek peace, and it has the fortitude to risk war. We have proved that we are a good and reliable friend to those who seek peace and freedom. We have shown that we can also be a formidable foe to those who reject the path of peace and those who seek to impose upon us or our allies the yoke of tyranny. In this age when there can be no losers in peace and no victors in war, we must recognize the obligation to match national strength with national restraint. We must be prepared at one and the same time for both the confrontation of power and the limitation of power. We must be ready to defend the national interest and to negotiate the common interest. This is the path that we shall continue to pursue. Those who test our courage will find it strong, and those who seek our friendship will find it honorable. We will demonstrate anew that the strong can be just in the use of strength; and the just can be strong in the defense of justice. We will serve all the Nation, not one section or one sector, or one group, but all Americans. These are the United States–a united people with a united purpose. An assassin’s bullet has thrust upon me the awesome burden of the Presidency. I am here today to say I need your help; I cannot bear this burden alone. I need the help of all Americans, and all America. This Nation has experienced a profound shock, and in this critical moment, it is our duty, yours and mine, as the Government of the United States, to do away with uncertainty and doubt and delay, and to show that we are capable of decisive action; that from the brutal loss of our leader we will derive not weakness, but strength; that we can and will act and act now. This is our challenge–not to hesitate, not to pause, not to turn about and linger over this evil moment, but to continue on our course so that we may fulfill the destiny that history has set for us. Our most immediate tasks are here on this Hill. First, no memorial oration or eulogy could more eloquently honor President Kennedy’s memory than the earliest possible passage of the civil rights bill for which he fought so long. We have talked long enough in this country about equal rights. We have talked for one hundred years or more. It is time now to write the next chapter, and to write it in the books of law. In short, this is no time for delay. It is a time for action–strong, forward-looking action on the pending education bills to help bring the light of learning to every home and hamlet in America–strong, forward-looking action on youth employment opportunities; strong, forward-looking action on the pending foreign aid bill, making clear that we are not forfeiting our responsibilities to this hemisphere or to the world, nor erasing Executive flexibility in the conduct of our foreign affairs–and strong, prompt, and forward-looking action on the remaining appropriation bills. In this new spirit of action, the Congress can expect the full cooperation and support of the executive branch. And in particular, I pledge that the expenditures of your Government will be administered with the utmost thrift and frugality. I will insist that the Government get a dollar’s value for a dollar spent. The Government will set an example of prudence and economy. This does not mean that we will not meet our unfilled needs or that we will not honor our commitments. We will do both. As one who has long served in both Houses of the Congress, I firmly believe in the independence and the integrity of the legislative branch. And I promise you that I shall always respect this. It is deep in the marrow of my bones. With equal firmness, I believe in the capacity and I believe in the ability of the Congress, despite the divisions of opinions which characterize our Nation, to act–to act wisely, to act vigorously, to act speedily when the need arises. We meet in grief, but let us also meet in renewed dedication and renewed vigor. Let us meet in action, in tolerance, and in mutual understanding. John Kennedy’s death commands what his life conveyed–that America must move forward. The time has come for Americans of all races and creeds and political beliefs to understand and to respect one another. So let us put an end to the teaching and the preaching of hate and evil and violence. Let us turn away from the fanatics of the far left and the far right, from the apostles of bitterness and bigotry, from those defiant of law, and those who pour venom into our Nation’s bloodstream. Public Papers of the Presidents of the United States: Lyndon B. Johnson, 1963-64. Volume I, entry 11, pp. 8-10. Washington, D. C.: Government Printing Office, 1965.